Let’s face it; reading dull policy documents in compliance training is more likely to send your employees to sleep rather than help them retain valuable information. Through gamification, you can add pizazz to otherwise dry topics to make them memorable, and even fun. Let’s look at how 3 gamification elements can be applied to create a unique, engaging solution. We’ll do this by reviewing an award-winning solution called ‘Quest of Honor,’ created by PulseLearning, that won the golden award at the 2017 prestigious Brandon Hall Group Excellence Awards in the category, ‘Best Use of Games and Simulations for Learning’. It’s not much fun to play a game until the halfway mark, is it? Most of us are eager to win and see what happens at the end. Setting the learner a challenge, goal, or mission to complete is a fundamental element of a gamification solution. It’s the achievement of the goal that provides motivation to complete the learning tasks along the way. Learners are always intrigued by the final outcome, and whether they can achieve completing a task or not on time. Most learners enjoy competing and enjoy winning even more. In ‘Quest of Honor,’ for example, the learner is a traveler transported back in time to a faraway land that is experiencing corruption from the neighboring ‘Kingdom of Corruption’. The learner’s mission is to gather troops to go up against the war-hungry king, and bravely guide them back to the safety of the ‘Castle of Compliance’. 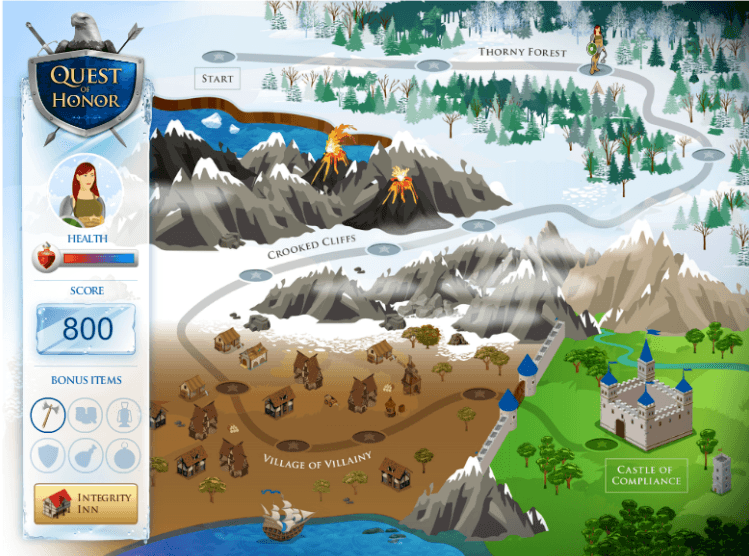 A key characteristic of gamification in online learning is a non-linear, exploratory progression through content. Think of quest-based video games where you can select environments to visit from a map, each with a specific task to be completed. These locations can be selected in any order, giving learners a sense of choice and control in orchestrating their own learning experience, also a key principle of adult learning. Adult learners tend to feel more satisfaction when they can select what to learn and when. This is actually an option that gives them absolute freedom and a sense of confidence and safety. In our example, learners are provided with a manuscript that contains corporate policies that must be reviewed since they provide clues for completing challenges throughout the journey. The manuscript is accessible at any time to assist learners with learner-centered decision-making throughout the journey. Learners, then, select locations from a map to visit, which doubles as the module menu. Successful gamification includes an excitement factor and a sense of anticipation that comes from unexpected experiences. What would a game be without risk and reward? Who would enjoy a boring and stable experience that gives you no incentive to move on anyway? So, referring to ‘Quest of Honor’, each location contains tasks strategically mapped to key areas of corporate policies. The learner must face numerous challenges and temptations at each location in order to move forward in the quest and reach the ‘Castle of Compliance’. The challenges can be overcome though by applying the specific knowledge from previously accessed content. This solution also includes opportunities for replay. At intervals throughout the journey, learners are faced with the ‘Code of Conduct’ scenarios in the guise of chance encounters. What does this exactly mean? Well, if learners answer correctly, they can play it safe, and keep rewards that can later be exchanged for a second chance at a failed challenge. Otherwise, they can take a risk and exchange the reward for points to increase their overall score. Now, isn’t that more exciting than reading through policy documents? 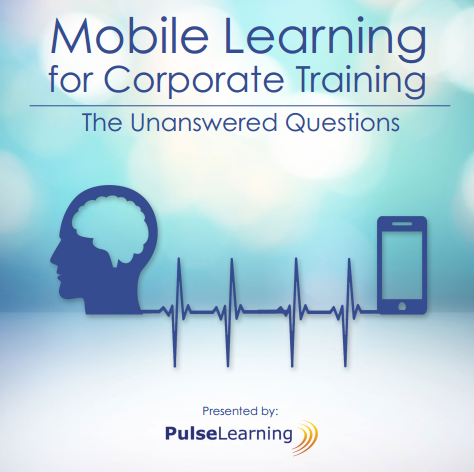 Could your corporate training benefit from gamification? PulseLearning is an award-winning, global learning provider experienced in developing creative, engaging, and innovative eLearning and blended training solutions.